The city of Sugar Land hosted its third annual business appreciation event. The city of Sugar Land hosted its third annual business appreciation event, the Leadership and Legacy Luncheon, on Wednesday, Dec. 19. The luncheon, held in partnership with the Sugar Land Legacy Foundation, celebrates the outstanding performance, leadership and contributions of Sugar Land’s diverse business community. 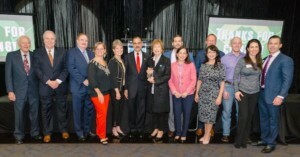 “Every day, you make our community a better place to live, work and play – and it is truly a privilege for us to get to work alongside you to help your businesses thrive and be successful in Sugar Land,” said Elizabeth Huff, director of economic development for the city of Sugar Land, at this year’s event. Sugar Land’s philosophy of fostering a pro-business climate, also referred to as the “Sugar Land Way,” has built a strong economy that continues to be recognized on a national level. The city is a premier location for global companies ranging from local startups to multinational organizations. This year’s event was held at Constellation Field, home to the 2018 Atlantic League Champion Sugar Land Skeeters and an example of one of the city’s many public private partnership projects. The event also featured Reid Ryan, president of business operations for the Houston Astros, as the keynote speaker. At the event, the Sugar Land Legacy Foundation also presented the Sugar Land Legacy Awards to recognize individuals and organizations that have made a significant, lasting impact on economic development and overall prosperity in Sugar Land. This year, they were presented to the late Herb Appel, who served as president and chief executive officer of the Fort Bend Economic Development Council for 27 years and NALCO Champion, an Ecolab Company, which in 2016 completed the consolidation of its Houston-area offices and centralized its headquarters in Sugar Land. The Sugar Land Legacy Foundation Board of Directors selected recipients from nominations based on their commitment, business experience, tenure, service and leadership in Sugar Land. Members of the Sugar Land Legacy Foundation (L-R) include Gene Reed, John Null, Brent Leftwich, Patty Godfrey, Betty Baitland and Sunny Sharma with members of the Appel Family, including Emelia Appel, Patrick Valentz, Veronica Valentz, Erik Appel, Monica Appel, Barrett Appel, Kitee Valentz and Jason Valentz.